Cameron Clayton was a highly regarded and rugged player who was recruited by Richmond at 16 years of age from New Norfolk. He came under notice at the 1972 Australian Schoolboys Carnival, where he was named All Australian, and was subsequently enticed to Richmond on the promise of grand final tickets for all of his family. However, he didn’t tell the Richmond officials he had 4 brothers and 10 sisters. Clayton made his senior debut for the Tigers as a strongly built 17-year-old and in his first season came off the bench for Richmond in the 1974 grand final to finish his debut season a premiership player. Despite being 180cm in height he was often used in a small midfielder role and he enjoyed four consistent seasons with the Tigers. He continued his career with Melbourne in 1979 and celebrated his 100th VFL game at Princes Park in the final game of the 1981 season. 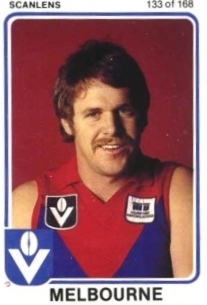 However, after managing just one game the following year, he crossed to Essendon where he played in another grand final, this time finishing on the losing team when the Dons were well beaten by Hawthorn in 1983. Cameron Clayton had been recruited to Essendon by Kevin Sheedy, one of his teammates from 1974, on the basis that he had the sort of on-field demeanour that could help harden the Bombers’ resolve to tough out hard games against superior opposition such as Hawthorn and Carlton. Sheedy had scoured the country in 1981 for tough footballers, and Clayton, being a no-frills half-back flanker nicknamed Rattler, was amongst them. In fact Clayton went one further and wrote himself into Essendon folklore at Windy Hill when he took on the hitherto untouchable Hawthorn goliath, Robert DiPierdomenico, and bloodied the big man. It was also in 1983 against Carlton that Cameron Clayton famously dislodged Bruce Doull’s headband, which team mate Tony Buhagiar then threw into the crowd. After a decade at the highest level Cameron Clayton succumbed to injuries that had plagued his career. However, he was able to conclude his playing days knowing that he was a well-regarded hard man of the competition and a premiership player.